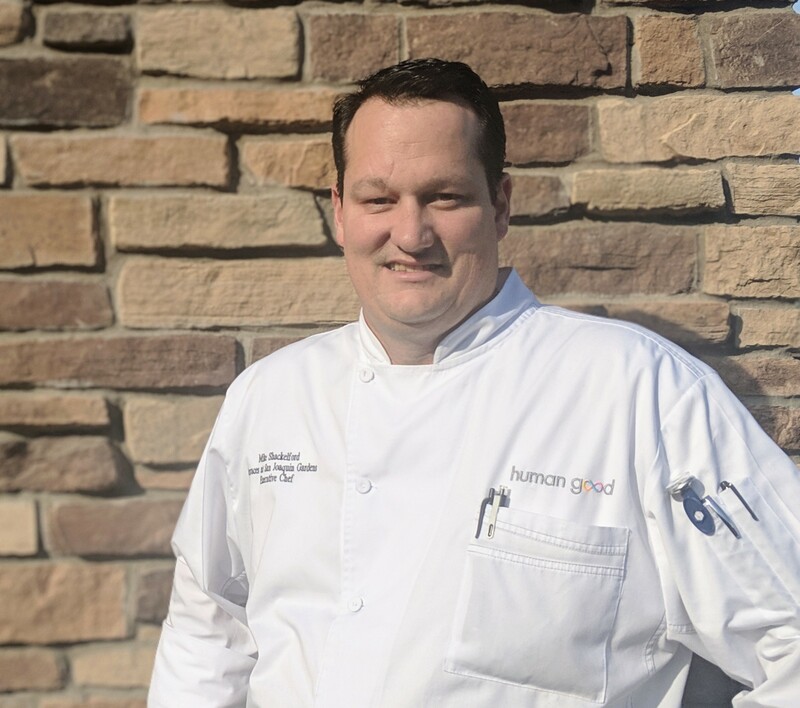 Chef Michael joined the Terraces at San Joaquin Gardens in January 2019. He previously worked as the ranch manager at Robert Johnson Farms Inc. in Madera, Calif. He also was executive chef and co-owner of Trelio Restaurant/Creative Food & Wine LLC in Clovis and served as executive sous chef at the Swissotel The Drake’s Q56 Restaurant in New York. He studied at the New England Culinary Institute. Q: What do you enjoy most about working at the Terraces at San Joaquin Gardens? A: I enjoy interacting with our amazing residents at the Terraces. I am in a unique situation because our residents are well-traveled, have discerning palettes and enjoy dining as an experience. Having such cultured and sophisticated residents allows me to be creative, use fresh local ingredients, constantly change our menus and continue to develop as a chef. A: My cooking style has been influenced working for traditionally-trained chefs throughout the country in fine dining restaurants, resorts and hotels. Since returning home to the central San Joaquin Valley, I’ve been able to apply my diverse cooking experience by using the freshest and highest quality ingredients from local producers and farmers markets to celebrate the seasons. A: As a chef who loves creating new menus and developing dishes using seasonal ingredients, I have to say that my favorite item is usually the latest dish I’m working on. I’ve always loved the seared diver sea scallops with porcini mushroom risotto, or our pistachio-crusted rack of lamb with a roasted root vegetable puree. To me those are timeless favorites that I’ll always come back to. The sweet and earthy components of both dishes work well together and pair nicely with a robust bottle of wine. A: I love cooking at home, but I like to keep it pretty simple. Grilled tri-tip or flank steak with Fresno State corn, red wine braised beef short-ribs, roasted chicken or fresh caught local trout from the Sierras are all family favorites. On the weekends, I might fire up the outdoor pizza oven and have my three boys invite some friends over. Q: What’s a tip or technique you use in the kitchen that people may or not know about? A: The tip I tell people who may be intimidated by cooking or just starting out is that there are no secrets in cooking. Everything is out there to be learned in cookbooks, television and online food blogs. Just about every dish, recipe and cooking technique is available. Being an amazing cook or chef takes a lot of practice and a lot of tasting. Great chefs taste every recipe or dish that they’re creating all of the way through the process. It’s how they learn how the recipe matures and develops with each step and each addition. Taste, taste, taste!